It is another stunning fall day out my windows this morning, my sister is visiting and we have a fabulous hike planned today. We had planned to do more crafting but with the weather is so sunny and warm it has been hard not spend time lots of time outdoors. I am playing along with Freshly Made Sketches today. I used stitched circles and added a layer of foam tape under the top circle. I heat embossed the sentiment and then popped it up with foam tape as well. I finished with some dew drops. 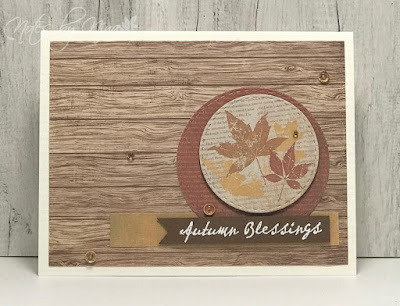 Supplies: Cream card stock, Designer Paper - Farm House Paper Company, TPC Studios - Autumn Harvest, Simon Says Stamps - Stitched Circles, dew drops. Lovely! The warm tones and those leafy images definitely bring autumn blessings to my mind! What a wonderful Fall-themed card! I love that wood background. Thanks for joining us at Freshly Made Sketches this week! I love your natural colors on the woodgrain background! SO perfect for the sentiment. Thank you for playing along with us at Freshly Made Sketches.